Here is a fun dessert that looks so pretty, and the best thing about it is, not only does it look amazing, it is so easy to make, and you know what else, it tastes as good as it looks. Panna cotta is one of the easiest desserts you can make. It is just heating up a bit of cream and sugar, add in just enough gelatine to set it and you have a perfect dessert. This one is a little bit fancier as you get two flavours of panna cotta, a strawberry and a vanilla panna cotta. The shape of the panna cotta allows you to have some fruit and some panna cotta with every spoonful, and who doesn't love berries and cream. To get this one perfect you just need to allow the strawberry panna cotta to set before you pour in the vanilla panna cotta, and you need to allow the vanilla panna cotta to set before adding in the fruit. This is a great make ahead dessert, you make the panna cotta the day before it is needed, then add the fruit just before serving. I've mentioned before that one of my favourite bloggers is Cooking with Manuela, I love her food and this recipe is one of hers, click on the link just above the ingredients list, there you can see her making this just in case you feel you like to see it being made first. The amount of serves you get will be determined by the size of the glasses you use. Use big ones, you get less serves, use small ones, you get more. I have doubled the original recipe, as there are five of us in my house, so 4 was never going to be enough, and a few extra serves definitely would be eaten the following day. So you can halve the recipe if you prefer. When tilting your glasses if they have long stems, I use a loaf tin or a baking tin with high sides. Find the right container. 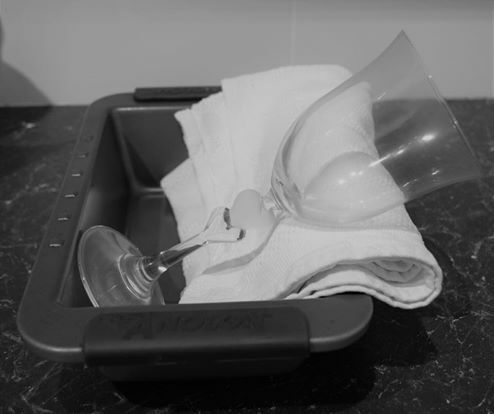 Placing a tea towel in the tin helps keep the glasses from moving around. If you have small stems on glasses as pictured, I use a large muffin tin as my support. I leave the strawberry seeds in the panna cotta, as they don't bother me, but if they bother you, just pass the strawberry mixture, once blitzed, through a fine sieve and they will be gone. You can substitute strawberries for a raspberry panna cotta version. If you do, then definitely take out the seeds, as raspberry seeds are a lot bigger. So if you are looking to impress someone on Valentine's Day, a birthday, an anniversary, whatever you are celebrating, this dessert is a perfect way to do it. 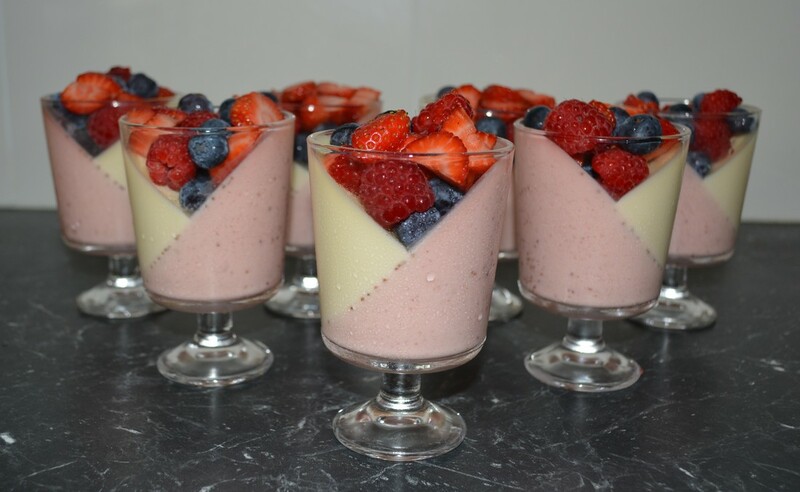 Start with the strawberry panna cotta: In a small bowl add the milk and sprinkle with the gelatine powder. Stir and set aside for about 5 minutes, while you get on with the next steps. Place the strawberries and lemon juice in a food processor or blender, blitz until the strawberries are pureed. In a small saucepan add the thickened cream and sugar. Stir the mixture constantly until the sugar has dissolved. Once it has dissolved, bring it to a slow boil, stirring occasionally. Remove the pan from the heat once it starts to bubble along the edges of the pan. Add the gelatine mixture to the cream, stir constantly until the gelatine has dissolved. Add the pureed strawberries and stir well to combine. Cool for 10-15 minutes. Place your glasses into a container that will tilt the glasses to about 45 degrees. I used 8 glasses. Pour the strawberry panna cotta mixture into a pouring jug and carefully pour the mixture into each glass. Refrigerate for about 2 hours, or until set. Now start the vanilla panna cotta: In a small bowl add the milk and sprinkle with the gelatine powder. Stir and set aside for about 5 minutes, while you get on with the next steps. In a small saucepan add the thickened cream, sugar and vanilla extract. Stir the mixture constantly until the sugar has dissolved. Once it has dissolved, bring it to a slow boil, stirring occasionally. Remove the pan from the heat once it starts to bubble along the edges of the pan. Add the gelatine mixture to the cream, stir constantly until the gelatine has dissolved. Cool for 15-20 minutes. Remove the container with the glasses from the refrigerator. Turn the glasses around 180 degrees, leaving them in the container. The strawberry mixture should now be on top. Pour the vanilla panna cotta mixture into a pouring jug and carefully pour the mixture into each glass. 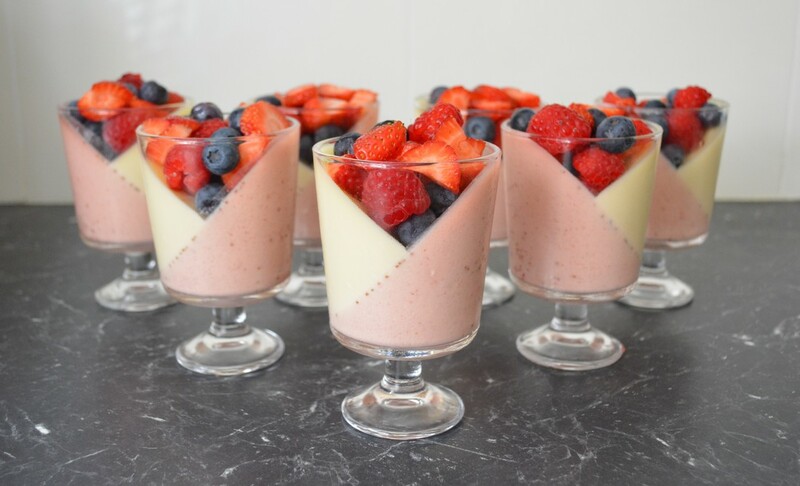 Fill the cups with fresh berries (raspberries, blueberries and strawberries) and serve.